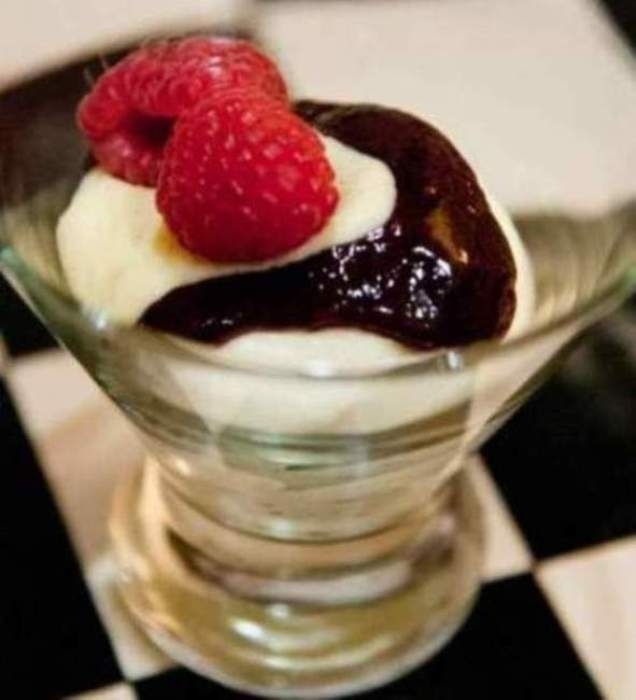 Try this White Chocolate Mousse With Raspberry Compote. You Will Love It. In microwavable bowl, with microwave on High (100%), melt the white chocolate, stirring every 30 seconds until smooth (about 2 minutes). Add the marshmallow creme and stir with wooden spoon until blended. In large bowl, beat the cream cheese with an electric mixer on medium speed until creamy. Add the white chocolate mixture and beat until smooth. Stir in the lemon juice. Using a rubber spatula, fold in the nondairy whipped topping. Combine frozen raspberries and sugar in medium saucepan. Bring to a boil over medium/high heat, stirring constantly. Set aside about 1 tablespoon of the raspberry liquid. Boil raspberry mixture, stirring constantly, until volume is reduced by half, about 8 minutes. Combine reserved raspberry juice and cornstarch and mix until smooth; add to raspberry mixture. Cook and stir until thickened, about 1 minute. Spoon half of the mousse into eight wine glasses. Layer half of the raspberry compote over the mousse layer. Repeat the layering with the remaining mousse and compete.